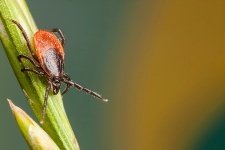 It turns out that ticks carrying the bacteria that trigger Lyme disease are not the only ones you have to worry about anymore: researchers have traced a new virus-carrying lone star tick that infected two men in Missouri. The findings, published in the American Journal of Tropical Medicine and Hygiene this week, found that two men were infected with the HRTV virus in 2009 in Missouri, and required hospitalization, although they both eventually recovered. Although researchers didn’t know what they were infected with at the time, they’ve now identified that lone star ticks were carrying this novel virus. The two men were bitten in early 2009, and came to the hospital with fever, headaches, and low white blood cell and platelet counts. Doctors expected their lab results to show a diagnosis of ehrlichiosis, a disease carried by ticks that live in this area—but instead they discovered a new, unheard of virus. Eventually, they diagnosed the men with the “Heartland” virus (HRTV), a virus that is carried by sandflies, mosquitoes, and ticks. Researchers don’t know if the virus is likely to spread; however, researchers have collected varieties of samples of ticks and found other ticks that did carry the HRTV virus. To help prevent the spread of this disease, the U.S. Centers for Disease Control and Prevention and the Missouri Department of Health and Senior Services is working to identify all sources of the virus and contain them. The biggest problem is that to date, there’s no treatment available for the HRTV virus and, unlike other tick-borne diseases such as Lyme disease and ehrlichiosis, HRTV is a real virus which doesn’t respond to current antibiotics. If you’re wondering how to spot these disease-carrying bacteria, lone star ticks have, as their name suggests, one lone white spot on females. They’re common in certain areas of the U.S., especially northwestern Missouri. If you notice any symptoms, such as a fever, rash, or illness after time spent outdoors, visit your doctor and let him/her know you have been in the outdoors. “Scientists prove ticks harbor heartland virus, a recently discovered disease in the United States,” ScienceDaily web site, July 22, 2013; http://goo.gl/rT2V46, last accessed July 24, 2013.